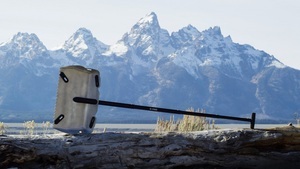 JACKSON, WY--(Marketwired - Dec 13, 2016) - High-end, portable tools innovator DMOS is proud to announce its second partnership with crowdfunding platform Kickstarter to debut the newest must-have shovel for the active outdoorsman or the home DIYer, the Alpha Shovel. Running from Dec. 13, 2016, at 8 a.m. PST to Feb. 9, 2017, at 11:59 p.m., DMOS "The Alpha Shovel: The Most Badass Shovel for Everyone" Kickstarter campaign provides loyal fans a first look at unbeatable pre-order discounts on the Alpha Shovel and its accompanying accessories: the T-handle saw and interchangeable T-grip. Last year on Kickstarter, DMOS introduced the Stealth Shovel, a pro-quality, packable tool for shoveling, raking, and biting through hard surfaces like ice and hard-pack snow. The Stealth Shovel went on to win the 2016 ISPO Brand New Hardware Award. DMOS out-performed its funding goals on its original Kickstarter campaign for the Stealth Shovel and received rave reviews from the likes of ESPN, Outside Online, and Freeskier Magazine. Using customer feedback to build the newest products is in DMOS's DNA, DMOS returns to the Kickstarter platform for its ideal forum for conversation and dialogue with the company's most supportive consumers. "The response to the original Stealth Shovel Kickstarter campaign was stellar; fans loved it and called for more," said Susan Pieper, founder and CEO of DMOS. "We listened and are very excited to return to Kickstarter with the Alpha Shovel and its accompanying accessories. Backers and early adopters demanded a shovel with a larger blade be added to the assortment, but it had to be as indestructible, well-designed and portable as the Stealth Shovel. We built the Alpha Shovel to be the top shovel of the pack. This is the last shovel you will ever need." DMOS will also offer add-on accessories of the Saw and the D-grip as rewards for its Kickstarter backers. The campaign will be live on ks.dmoscollective.com. For more information about DMOS or the Patent pending Alpha Shovel, visit dmoscollective.com. Founded in 2015, DMOS, a Jackson Hole, Wyoming-based company, was created with a simple desire to innovate outdoor tools for the backcountry to the backyard and everywhere in between. Its original product, the Stealth Shovel, was a purpose-built skier and snowboarder cult hit for building snow jumps. Today, DMOS has extended into consumer's everyday lives from outdoor adventures to home and garden. DMOS' tools are thoughtfully designed, versatile, portable, and built to last. Whether used for home, car, RV, garden, outdoor or extreme sports, they bring out the professional in everyone. For more information, visit DMOS.